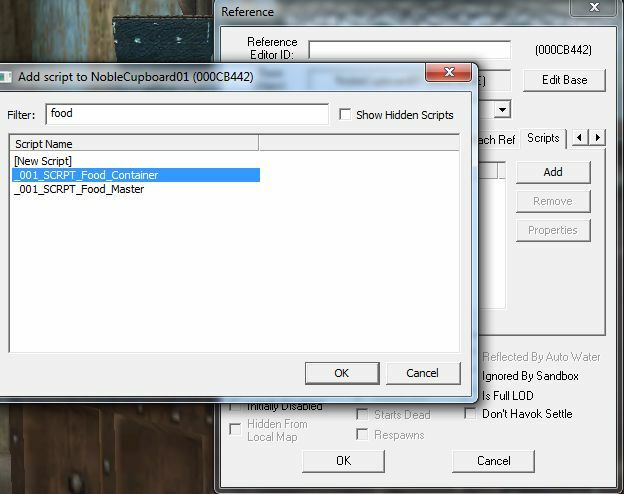 Bert's CK Tutorials - Self-refilling food displays! hurt if it refilled itself... so long as there are more in the main food container. be static to build yourself exactly this! be doing A for apple! 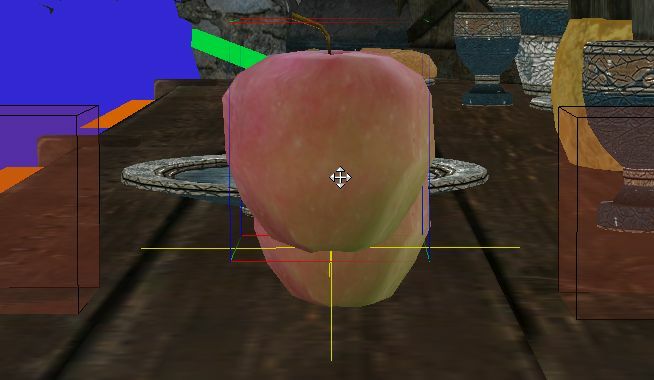 Add an apple to any surface as a base for your triggers. one trigger per food container, depending on how you split you foods up). I'll only need the one. side (it's best to move it over the container you'll be using, just to keep it all together). 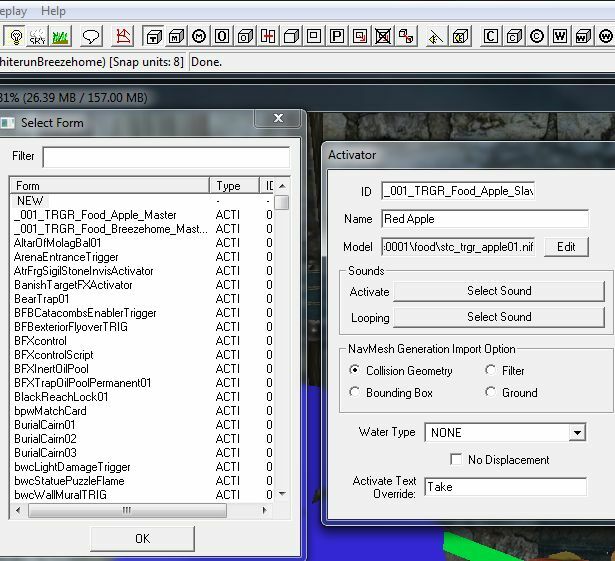 will need a name to be activatable from the fake apples. 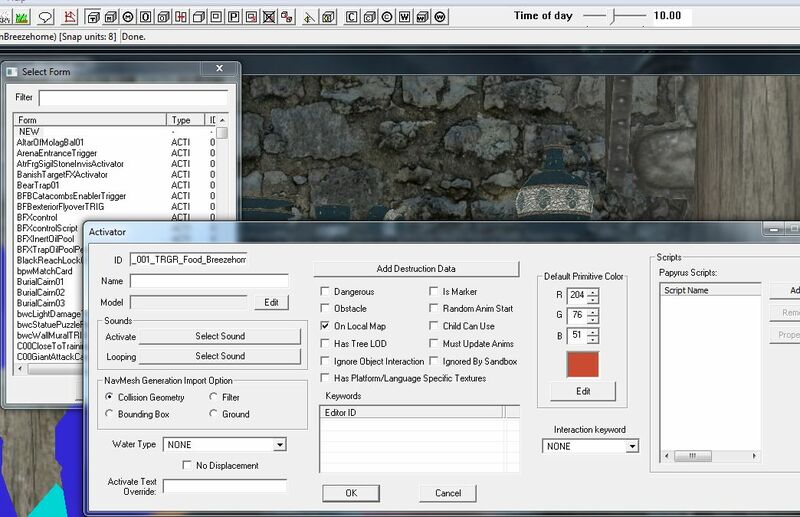 OK out then double-click it, go to the Primatives tab and tick Player Activation. 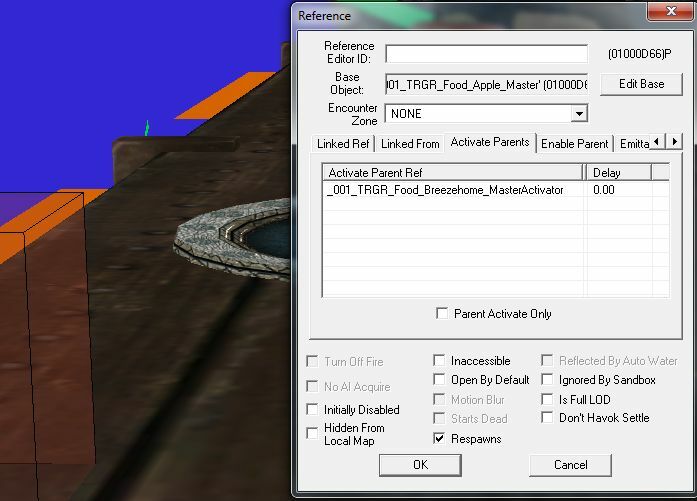 Then along a few tabs to Activate Parents, Rigth-Click in the list area and select New. 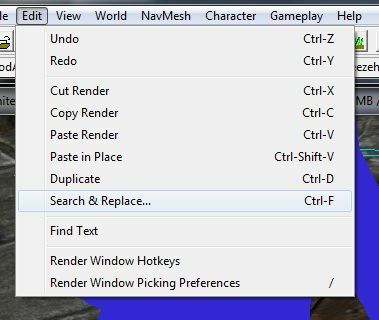 When the new window opens, hit Select Reference In Window. 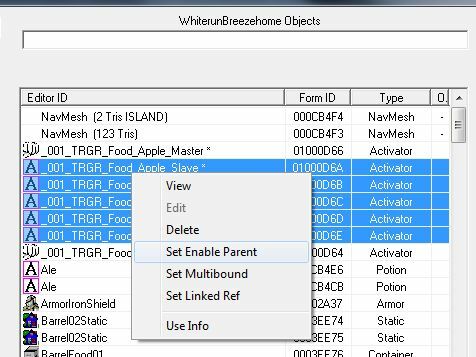 Which will turn your cursor into a small target, double click this on the containers Master Trigger to link them and OK all the way out. Now you have your two main triggers for this food-type. 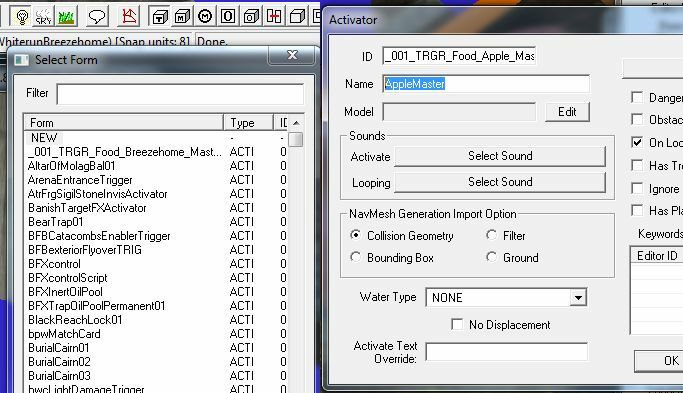 Take Red Apple instead of Activate Red Apple. 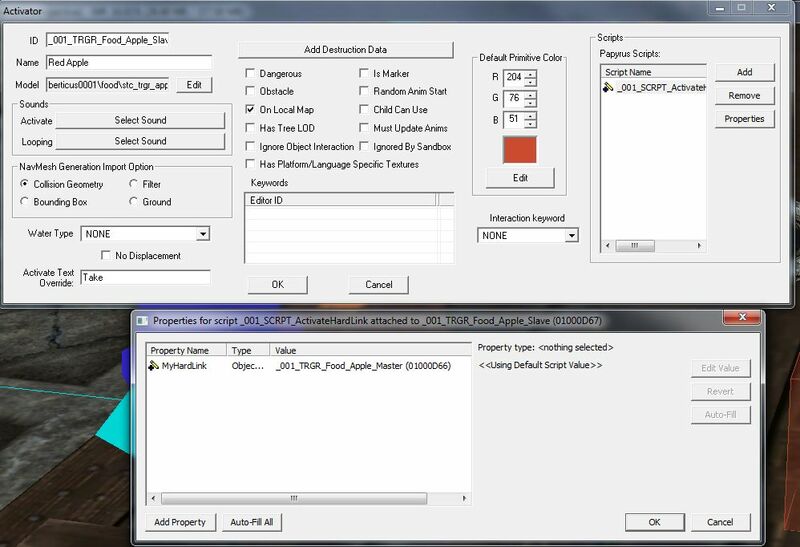 set Primative Type to None then hit OK to finish. 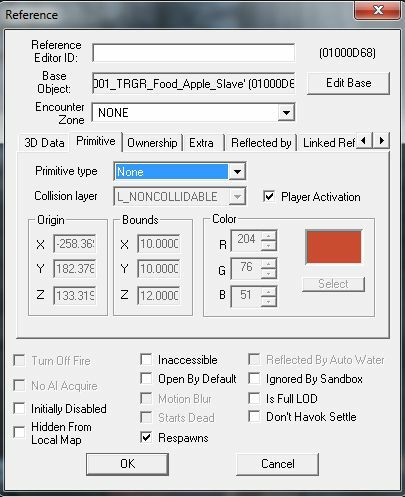 and hit F5 to refresh, bingo, one apple trigger! Now lets add some scripts. 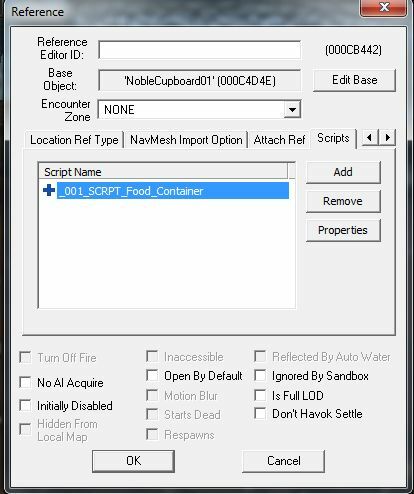 Double-click your container, head to the Scripts tab and add the script _001_SCRPT_Food_Container. 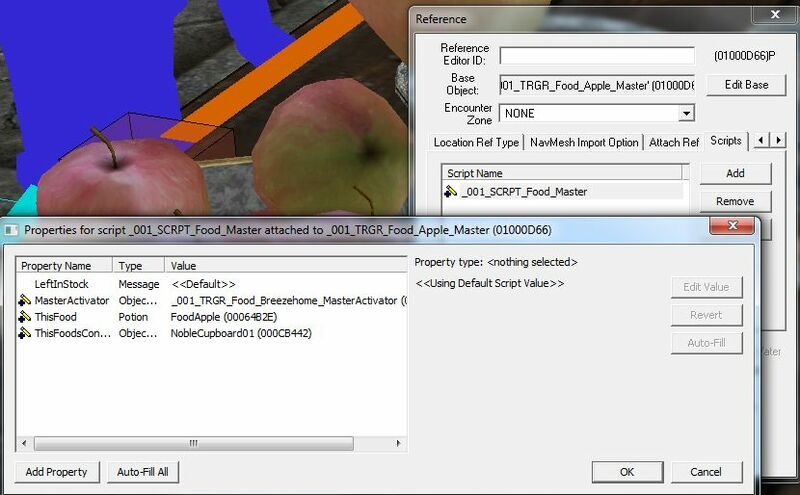 Now open the script properties and link MasterActivator to the first trigger you made. for. Leave the message for now. 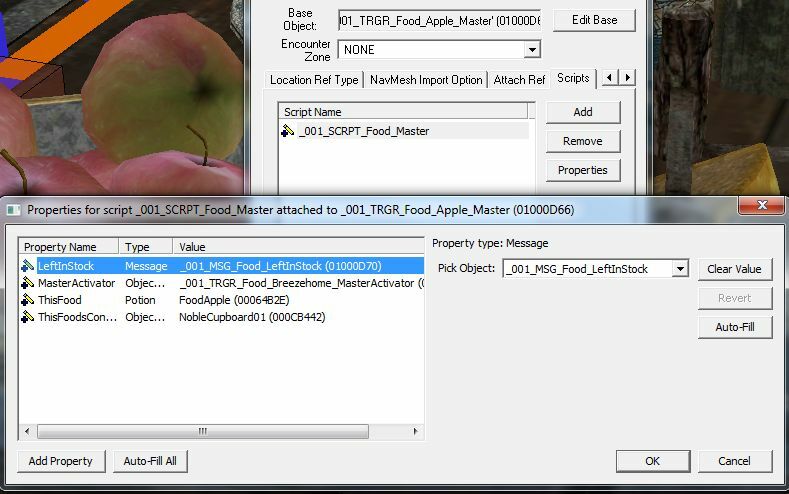 _001_SCRPT_ActivateHardLink and in it's properties link it to the apple master trigger. You now have all the needed pieces, it's time to set them up! 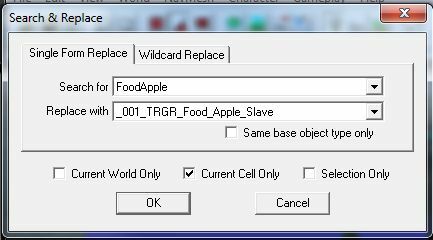 Start by deleting your real apple (you don't need that one now) and your fake apple. 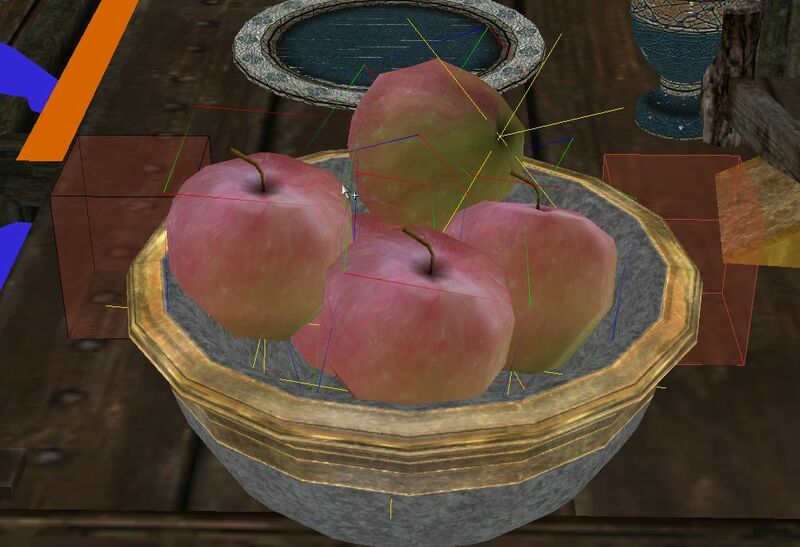 Using "real" food set up your displays, for this I'll do a bowl of apples. 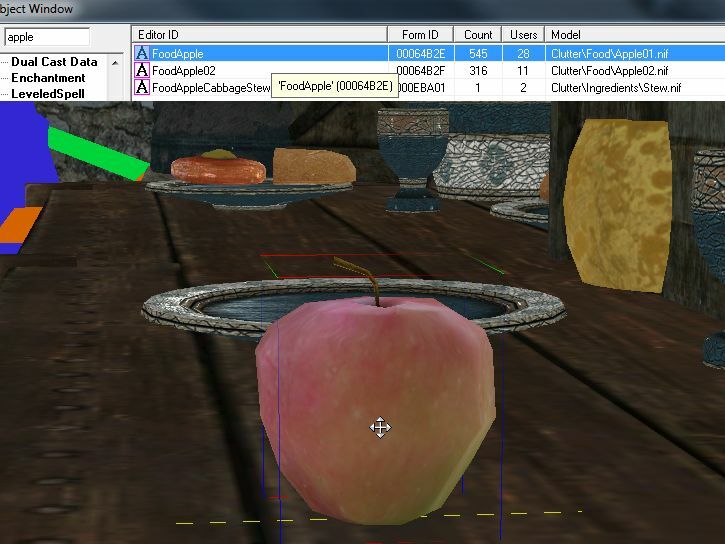 anything that can be activated, dressers and such, as their activation will override the fake food. for a more organic feel to things. 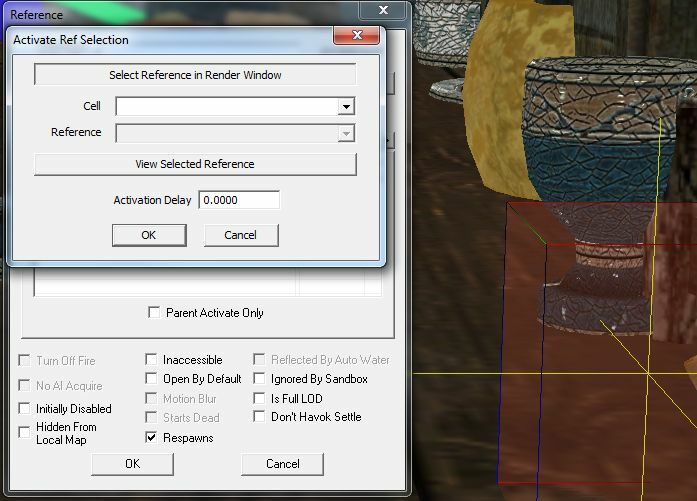 Turn off Havok and do fine adjustment in case of floating or gaps. 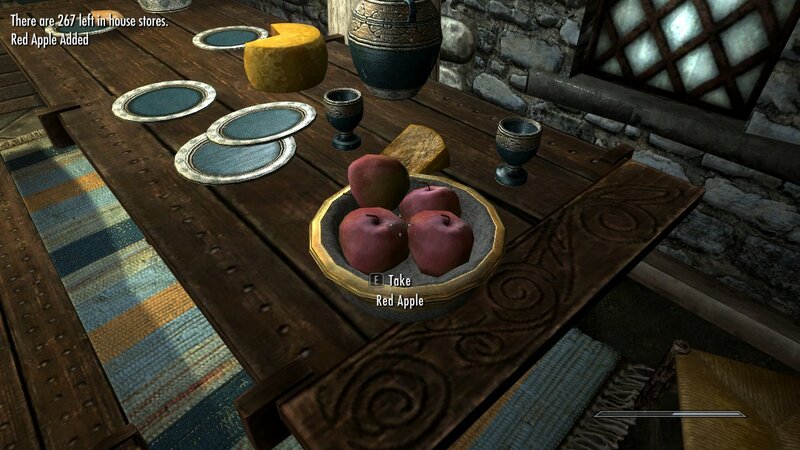 One good-looking bowl of apples! iit will replace all food of that type with the fake versions. bar at the top of the list to shuffle). 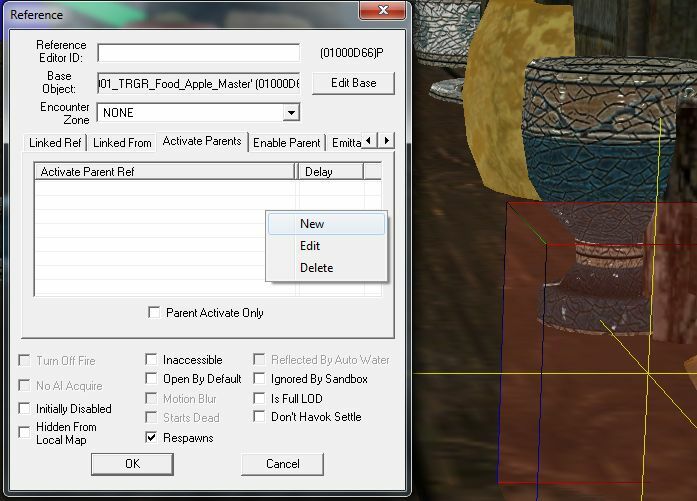 Now Right-click any of the selected foods and select Set Enable Parent. 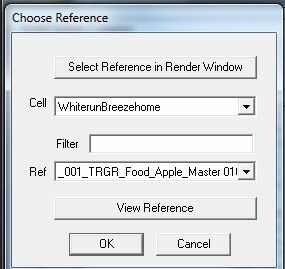 This will open a small Select Reference window, select the food-types master, in this case Apple_Master. 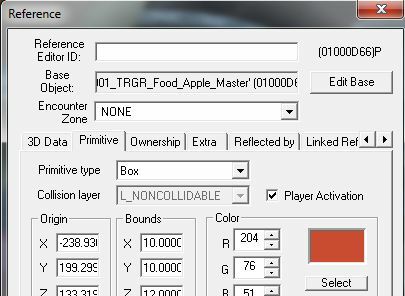 the master of this food type. OK that and now all thats left is the massage. house stores." 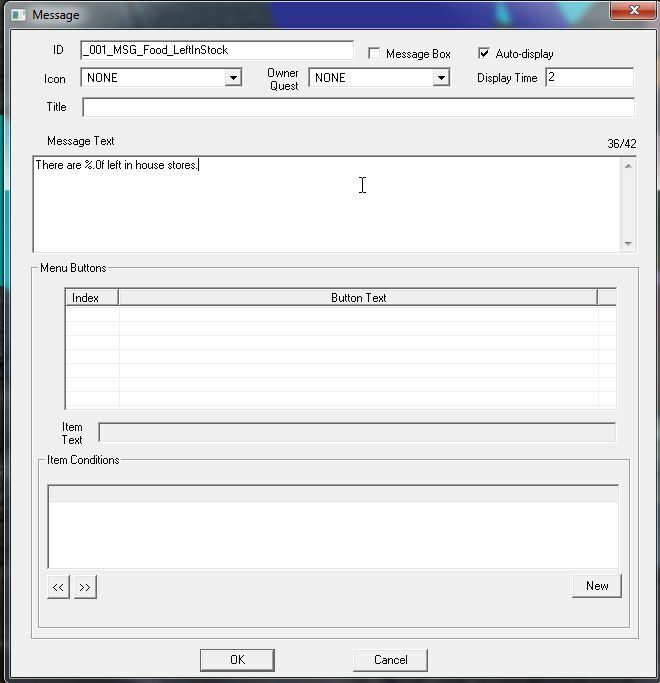 and set it to Auto-Display. updates the message each time! Head in-game and try it out! 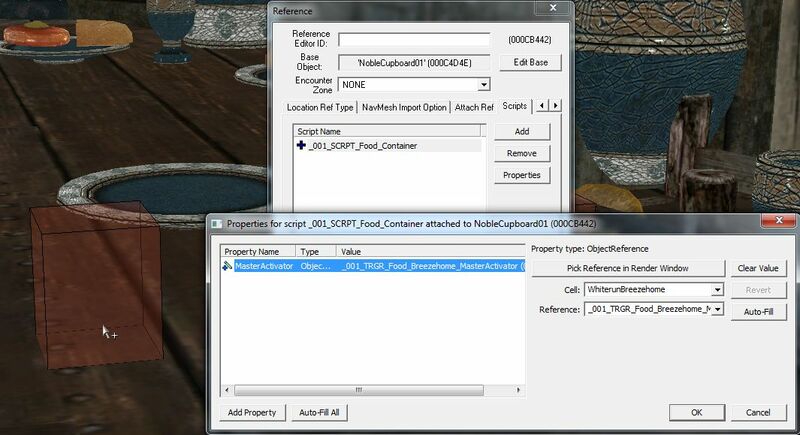 will be no freebies and the player will have to fill the containers for foods to appear.